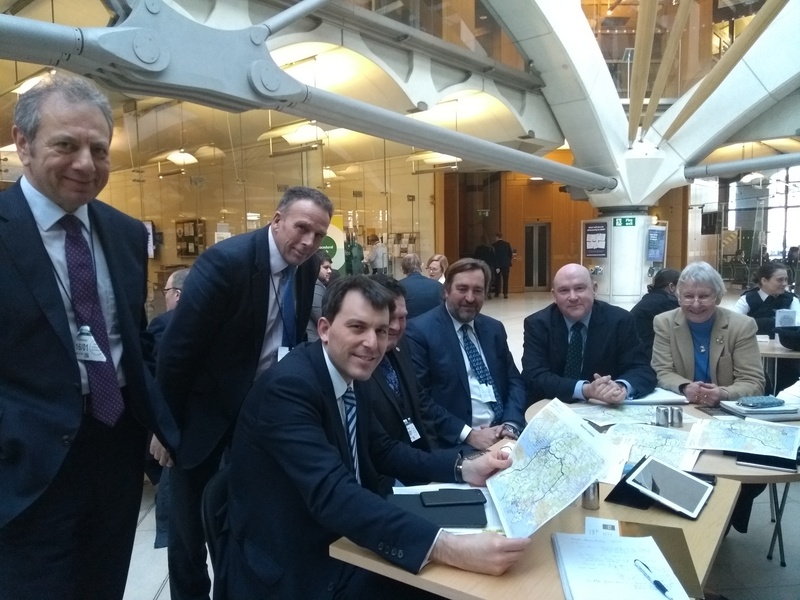 Transport issue have pretty much dominated this week with meetings in London, Exeter and more locally around Hinton Blewett – all concerning different aspects of traffic and travel affecting Bath and North East Somerset. South West Rail was under the spotlight at a Travel Watch South West meeting in Exeter on Monday where the Great Western Franchise consultation was being discussed. Travel Watch South West speaks up for passengers and lobbies for the improvement of public transport in the region. It works with local authorities, business organisations, partnerships and other stakeholder groups in the region. Getting better rail services across the region is one way to help us tackle congestion and improve our air quality especially in Bath. Another way we are addressing this issue is lobbying for better transport links between the Channel ports of Southampton and Poole and the M4 corridor. Part of the issue this poses for Bath, of course, is the considerable congestion as vehicles pour on to A36/A46 through Bath. The issue of air quality is a longstanding one and having all these additional vehicles passing through B&NES compounds the problems we have with rush hour traffic, a north south link road would divert HGVs and additional traffic away from the city. Increased traffic not only creates air quality issues but also takes its toll on the roads themselves which we work hard to maintain. However they are often left in a poor state when utilities have to dig them up. This was brought to my attention by Hinton Blewett Parish Council. I went out to meet parish councillors to look at roads in their area which have been affected by this. Away from transport issues this week I took the chance to meet Dr Chris Stephens who took up his post as the director of The Holbourne Musuem, about six months ago having previously been Head of Displays and Lead Curator, Modern British Art at Tate Britain. The museum is yet another wonderful asset in Bath and has an exciting programme ahead this year under Dr Stephen’s guidance. If you have never visited it I recommend you take a look around and enjoy its wonderful collections.